Once a scene marker is created, you can modify the duration of the marker, modify its colour, apply a note to identify it, or move it. In the Timeline view, select a marker. Select Storyboard > Markers > Edit Marker. Right-click in the frame counter area and select Edit Marker. 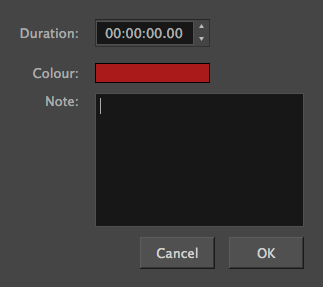 The Marker dialog box opens. NOTE For more information on the Marker dialog box parameters, see Marker Dialog Box.